IT'S THE BEST OF BOTH BOOKS! Okay, technically it's just BOTH BOOKS in ONE seriously funny and scary easy to read, purchase only once, compendium of the deranged! And you save almost a WHOLE DOLLAR! Do we rock or do we rock? An anthology of the strange, bizarre, and just plain weird.Zombies, vampires, ghosts, and ...crickets? Try a taste of writing from two very different fantasy authors. Flash stories are super short and perfect for when you 'just have a minute'. This anthology contains 15 stories from authors Sean Hayden and Jen Wylie. Run the rampart of emotions in this exciting mix of tales. From humor to twisted, there is something for everyone.Unicorns, zombies, devils, dark whispers, teddy bears, and ...fireflies? Try a taste of writing from two very different fantasy authors. Flash fiction stories are super short and perfect for when you 'just have a minute'. 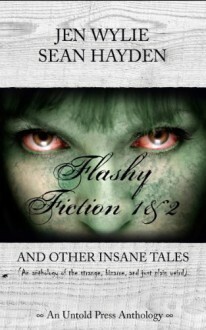 This anthology contains 15 stories (both flash and longer short stories) from authors Sean Hayden and Jen Wylie. Run the rampart of emotions in this exciting mix of tales. From humor to horror, sweet to twisted, there is something for everyone.~*~Note: Some stories contain adult language.